Warren Ellis relaunches Project Superpowers! This.....is......AWESOME! I'm so jazzed, PS is what brought me to Dynamite! "all but..."? You're obviously a far more patient man than I am. I had given up completely, especially after The Owl mini faded away without causing a ripple. Alas, since Ellis is too dark for my taste, I will not be picking this up. I hope the previous version ended with some closure? Me too, admitedly. I can't wait to check this out! It was down to a case of 'if it shows up it shows up' but the characters were to good to totaly give up on. Glad we are finally able to let you know about our relaunch. I know that we were hoping for an earlier relaunch after the Owl, and the Owl series was fantastic, but it did not sell well enough, so to continue, we knew we had to get someone who would bring in a huge audience. Warren is that man. It's certainly taken much longer than we would have wanted, but as they say, good things come to those who wait, and I definitely think Warren is worth the wait, as he will bring a great series and a larger audience. This is a continuation of the original P:SP line, right? You aren't doing a stupid reboot. Right? Please say it's a continuation. I want the rest of the story, not some new version that has nothing to do with the original stuff. Warren Ellis is certainly welcome to the Project Superpowers universe in my book. Last edited by Renaud; 04-17-2014, 04:11 PM. While I can't say much as it would give away the story, and we purposely did not go story specific as we will be building up to hopefully grow the audience, I think that you will want to give Warren's story a chance. It's really good, and I think that you'll enjoy it. That's all I'm comfortable saying today. Good things will come to those who wait. "Warren is truly a visionary storyteller and he's been given carte blanche to reimagine these characters and this world," adds Dynamite Senior Editor Joe Rybandt. "The results will appeal to his existing fans for sure, but the world he is creating is accessible to all from the start." Give it a chance. They obviously can't just pick up where they left off as if no time had passed. The original series didn't continue because the sales weren't there. They need to grab a whole bunch of new readers, otherwise this one won't fly either, but they can't burden those new readers with the backstory of what went before, several years ago. If Warren Ellis had gotten involved a few years earlier, it might have been different. Who knows, maybe we’ll get a PROJECT SUPERPOWERS YEAR ONE. One thing that never made sense to me in the original PSP series was the title. The title Project: Superpowers implies some sort of covert government initiative, like the Super Soldier Project (aka "Operation: Rebirth") that produced Captain America, or the Weapon X Project that produced Wolverine (among others). Yet that idea is never referenced in story terms in the original series. 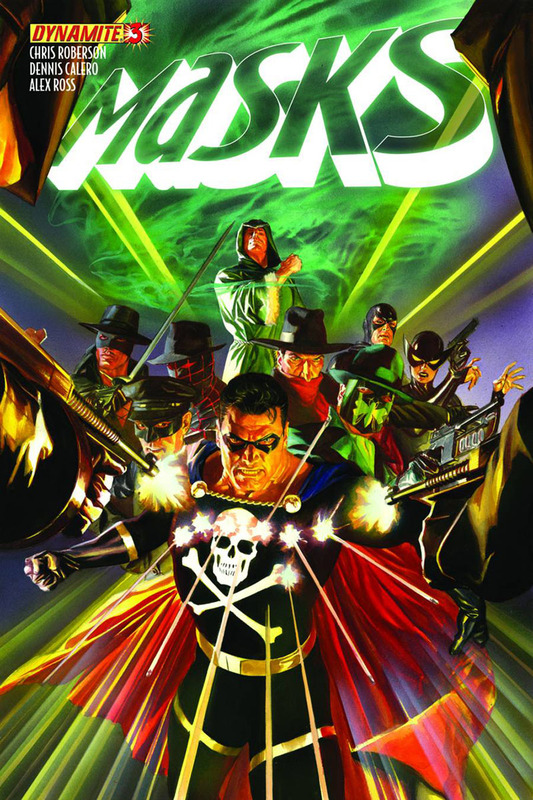 I realize the genesis of the title was that Alex Ross originally wanted to call the series simply Super Powers, but DC Comics objected to that because of the identically-titled 1980s Kenner action figure line of DC characters and its subsequent comic book tie-in titles, so with DE's series already on the cusp of being launched, the title was hastily changed to Project: Superpowers. Hopefully, Warren Ellis will address that point in his reboot of the series. A) Too much time passed since the end of the original series, and there weren't enough readers to warrant it continuing in the first place. Any relaunch is going to be dependent on attracting readers who didn't read the earlier series. B) There were a fair percentage of posters on these forums who critiqued the writing and certain plot points in the original series, even though they loved the characters. Seems like Dynamite is responding to those criticisms. C) If you're going to attract a high-profile name writer, you need to be as flexible as possible in giving him leeway to do his own thing. Last edited by pulphero; 04-18-2014, 05:55 AM. I find my self in agreement with Renaud and Pulphero as far as the need for a reboot and most of their other points. I enjoyed the first to PSP series but there were way to many characters involved. I can't wait to see what Warren has in store for us. I do think that Masks had maybe one or two to many characters or should have been a little longer to allow everyone a little for 'screen time'. Depending on the writing and chracter involvement, after six characters it can start getting crowded and Masks had eight or nine. A series of minis with one minor crossover mini and an occasional team up would work fine. Several characters Terror, Lama and DDD to name three are more then deserving of 'Year One' tales.